A mysterious object has hit Earth's Lunar Space Station. Superman saves the astronauts and repairs the damage. As he does so, they detect said object hitting the surface of the moon. When Superman investigates, he finds a giant lizard-like alien. The alien is dead, but before her death, she writes Superman and Batman's symbols in the moon's powdery surface. Who is this? And why is she here? Superman heads towards Gotham to obtain the help of the world's greatest detective. Gotham. Batman is fighting Clayface. With Superman's help they defeat him and take him back to Arkham. Later they meet at the Batcave where Superman gives Batman the lowdown about the events at the Lunar Space Station. Together, they go the moon to investigate. Batman concludes that the dead alien was a solo space traveler whose death was made to look like an accident. The Caped Crusader concludes that foul play is afoot. He is proven correct when he finds a secret camera watching them investigate. Unfortunately, upon discovery, the camera's self destruct mechanism is remotely detonated leaving no way for Superman and Batman to trace the source of the camera. The watchers are revealed to be the space bounty hunter Lobo and some unnamed alien. The unnamed alien has hired Lobo to track down and kill the Batman. They discuss the possibility of killing Superman too, but Lobo's price is too high. Meanwhile, Superman and Batman discover that the dead alien is holding a communication devise. They activate the devise and find a message written in Kryptonian. Apparently, there is another Kryptonian who survived Krypton's destruction. And that person is alive and well on the other side of the universe. Story - 5: The Good: There is so much good to say about this issue. 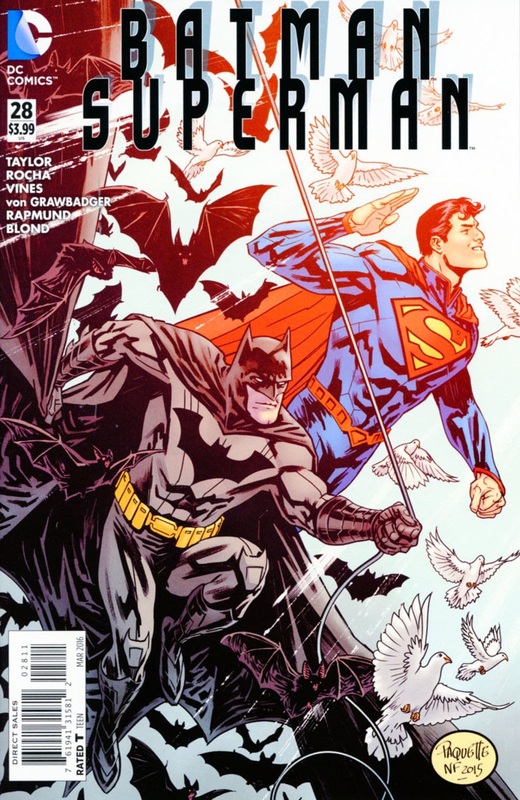 Tom Taylor writes a good ole fashion Batman/Superman story. 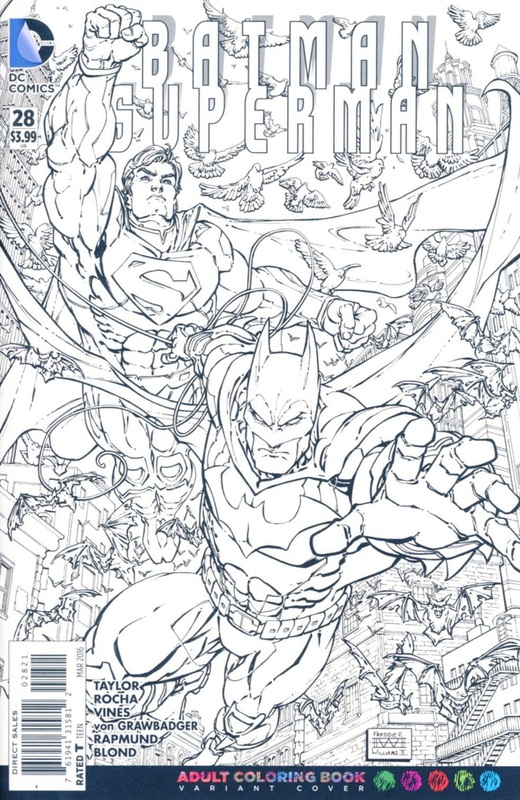 "What makes for an 'ole fashion' Batman/Superman story?" you ask. There's a Superman save. Check. There's Superman's optimistic attitude. Check. There's Batman's brooding attitude. Check. There's Alfred getting Bruce's Batsuit ready. Check. The heroes are likable. Check. And most importantly, there's fun. Check. And to make this story even better there's the outer space aspect, plus there's Lobo - my favorite Superman villain. (Insert girly sigh here. (Yes, I have crush on Lobo. Sue me)). He is magnificent. He's big and bad and snarky. I sometimes wish he was a good guy. The story is just so good. I could not wait to turn each page to see what happened next. This is the Superman and Batman that I love to read. Can't wait for Batman/Superman #29. The Bad: Nothing to put here. I loved all of it. Conclusion: Much better than the previous story lines. Art - 5: The quality of the art matches the story. We get great action shots mixed with appropriate dialogue. The reveal of the giant alien being was fantastic. She's definitely a mystery. Where is she from? Why is she like a reptile? The artwork on her is fantastic. I also liked Clayface. Usually he's drawn a monstrous blob. But Rocha gives him physical layers. And Lobo. He is drawn magnificently. He's big, bad and beautiful. The 'title' page where we see both the astronaut's face and Superman's reflection in the space helmet is amazing. Dittos for the splash page where Batman breaks free of Clayface. Cover Art - 5: Yes! Yes! Yes! Superman is flying off with the doves. Batman is swinging from his cable with bats flying around him. Superman is smiling. Batman is grimacing. And they booth look good. And the action is awesome.